I don’t get to New York as often as I would like to any more. I used to be able to count on at least a couple of trips each year for work, but not so much any more. This particular image was taken a year ago when my wife and I visited New York for our wedding anniversary. 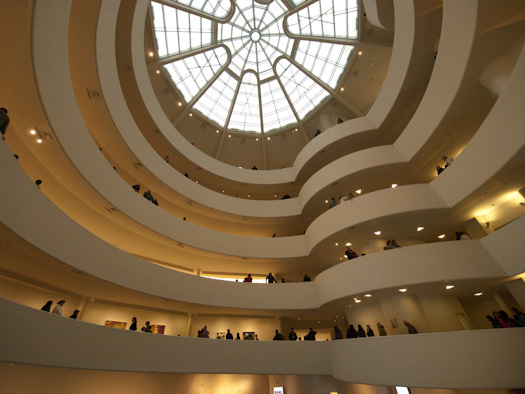 It was the first time I had visited the museum and I certainly hope to get back to see it again. It was a cloudy and somewhat rainy day when we visited which meant that the skylight above was mostly white, instead of blue. The interior was not extremely bright, so I had to bump my ISO to 1250 to get a reasonable shutter speed. Unfortunately the camera I was using at the time, an Olympus E-3, doesn’t do well at higher ISO settings. I love the camera, I just wish it did better at higher ISO. Processing for this image consisted mainly of some noise reduction in Lightroom and conversion to black and white. I bumped the contrast a bit in Photoshop and also brightened the image somewhat. I didn’t want to brighten the skylight area so I ended up masking the curve in that area. You can see in the raw image below that the color balance is a bit yellow. I should have shot my Whibal card to have something to compare it with. 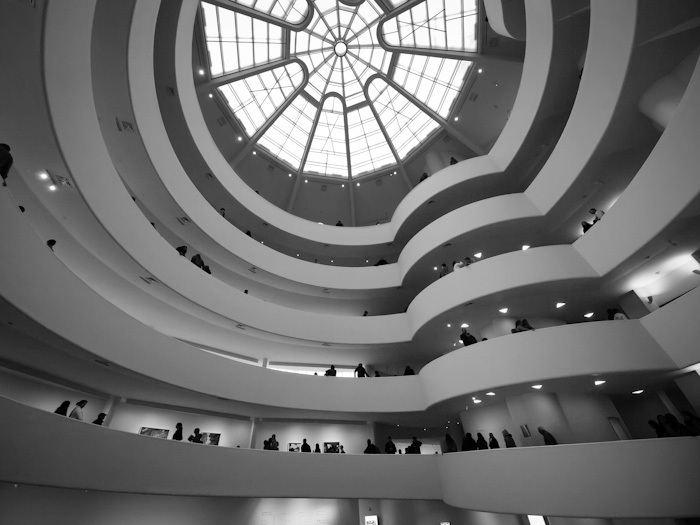 The Guggenheim is on my must-see list of places for when I finally get to visit NYC. I love the tiny people.